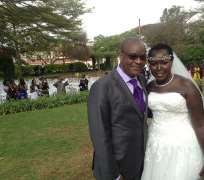 Come Sunday, September 15, 2013 the beloved man of God, Apostle Anselm Madubuko, the General Overseer of the Revival Assembly Ministries worldwide is set to host friends, family members and a few others to a thank you dinner/wedding party after his wedding ceremony that took place very recently in Nairobi, Kenya. We are of the thought that this might be a way to host some of those who couldn't make the Nairobi trip. The venue of this dinner is the Sheraton Hotel, Ikeja, Lagos and on hand as the master of the ceremony is none other than Julius 'The Genius' Agwu, the dapper comedian.